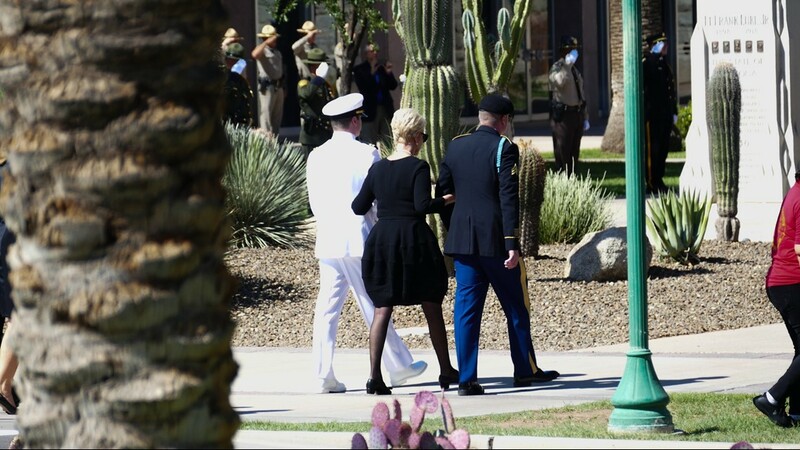 PHOENIX - Those in Arizona who knew, respected, watched and loved Sen. John McCain said goodbye to the man who was an American hero in the eyes of many and synonymous with the Grand Canyon State. A memorial outside of the mortuary where the senator's body rested early in the morning Wednesday was a quiet reminder of a man best known for his power and intuition to break away from the political pack. 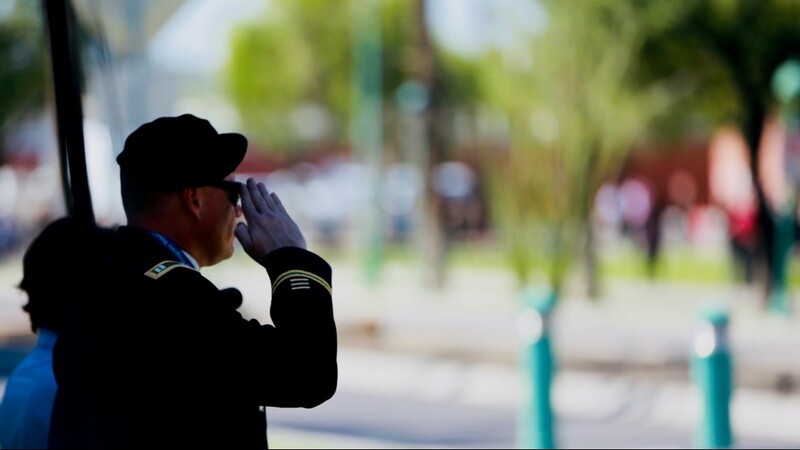 READ: Schedule of memorials and ceremonies honoring John McCain in Phoenix, D.C. The senator passed at age 81 "in the place he loved best" at his home near Sedona. His 82nd birthday would've been today, Aug. 29. 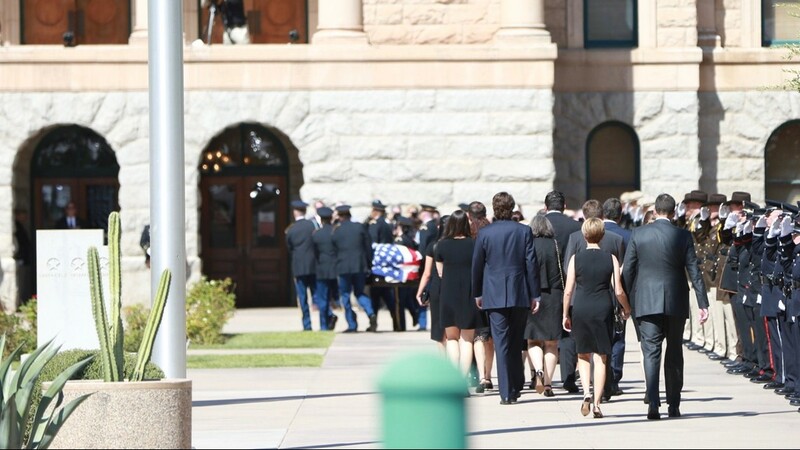 The air around the Arizona State Capitol was heavy as McCain's body moved from the A.L. Moore Grimshaw-Mortuary Wednesday morning. 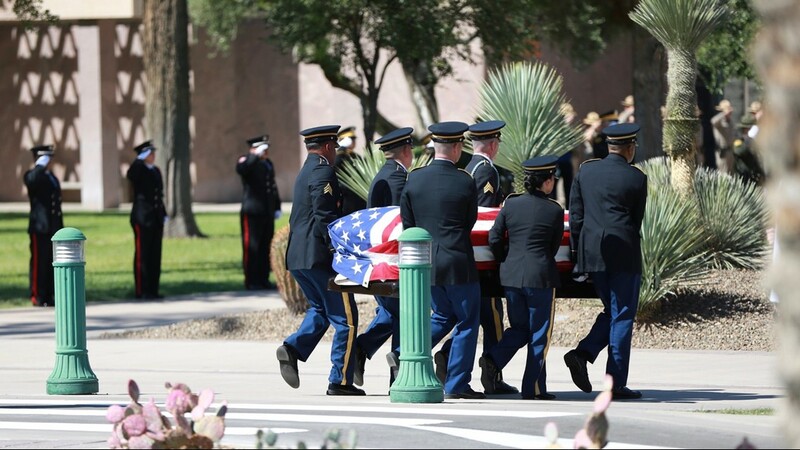 The motorcade carrying his American flag-draped casket arrived just before 10 a.m.
Gov. 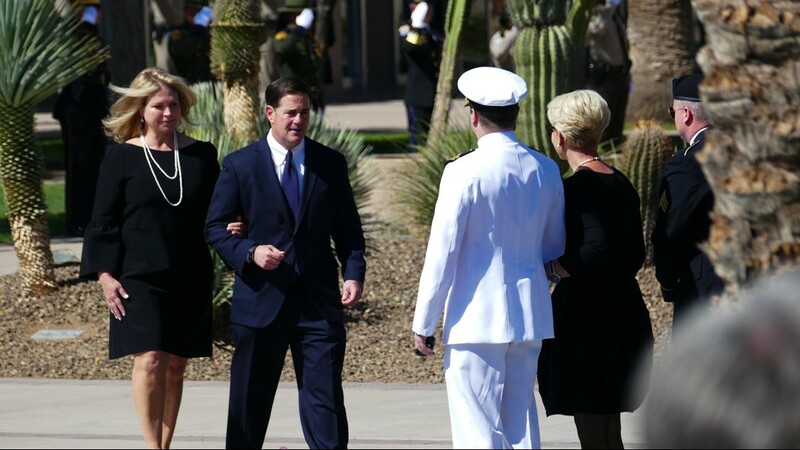 Doug Ducey greeted the McCain family as the Arizona National Guard Military Funeral Honors Team carried Sen. McCain's casket to the Arizona State Capitol Rotunda. 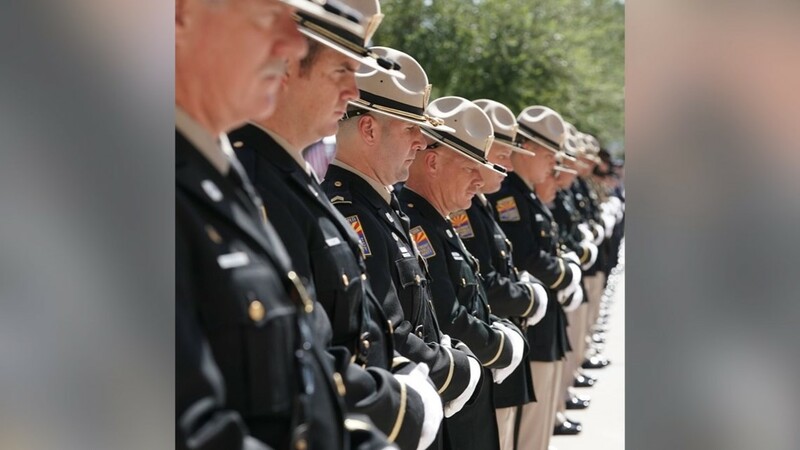 In the rotunda, Sen. John McCain will lie in state, guarded by DPS troopers atop the Arizona state seal, for 24 hours. He's only the third person to get such an honor in the state of Arizona in the past 40 years. 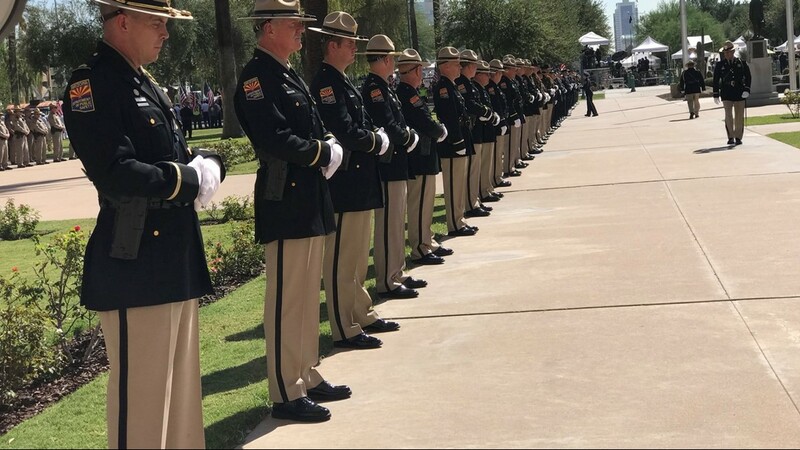 Thousands of people from across the country lined up to pay their respects to the late senator in Wednesday's 105-degree heat. According to the Phoenix Fire Department, 25 people have been treated for heat-related issues, and three were taken to the hospital. None of the patients were critical, firefighters said. As many as 15,000 people visited the capitol Wednesday, McCain's office said. After 8 p.m., mourners began waiting in a separate line to shake the hands of Sen. McCain's children, Doug, Sidney, Jack and Jimmy, who thanked those still at the capitol waiting to pay their respects. The private ceremony began with a prayer from Father Edward A. Reese followed by Gov. Doug Ducey and former Arizona Sen. Jon Kyl who both gave heartfelt remarks. Former Arizona Sen. Jon Kyl served alongside McCain in the U.S. Senate for nearly two decades. Kyl said McCain "believed in America, he believed in its people, in its values and in its institutions." "I've been with Senator McCain all around the world and I will tell you that he had better instincts about how and when and where to assert American power than any other leader I've known," Kyl said. The former senator said McCain had "been to more countries, knew more foreign leaders and had a better grasp of history than any other American official, including our secretaries of state." "He represented our values all over the world as senator from Arizona and America is stronger for his fierce defense of our values," Kyl said. "We can be proud he was our senator. I consider it a great privilege to have served with John and I will miss him as a friend and as a strong force for America in the world." Gov. Doug Ducey said when it came to Arizona there were two bigs things people think of: The Grand Canyon and John McCain. "His talk of country first wasn't simply a slogan on a yard sign," Ducey said. "It was what John McCain had done and demonstrated over and over and over again." Ducey said John McCain was about more than politics, he "brought us above politics." 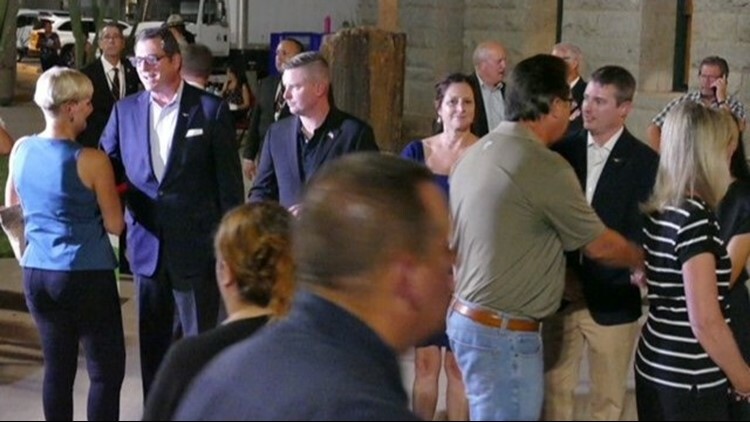 "John is probably the only politicians who could get us to set aside politics and come together as a state and nation," Ducey said. The governor called McCain Arizona's "favorite adopted son." 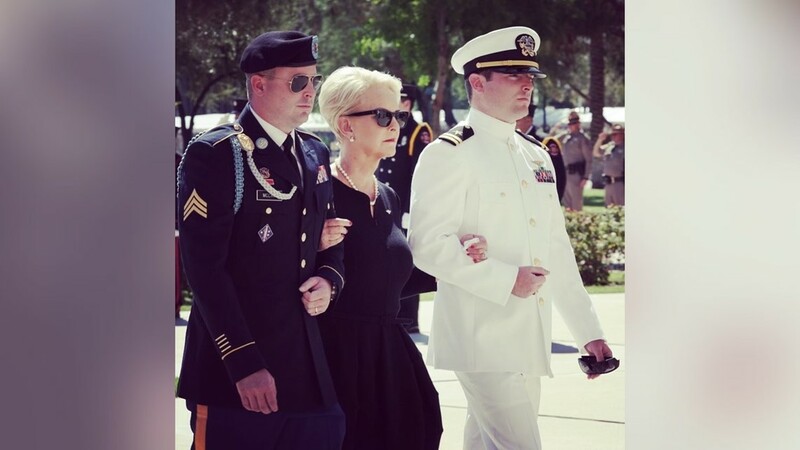 It was a line that made Cindy McCain smile just for a moment. 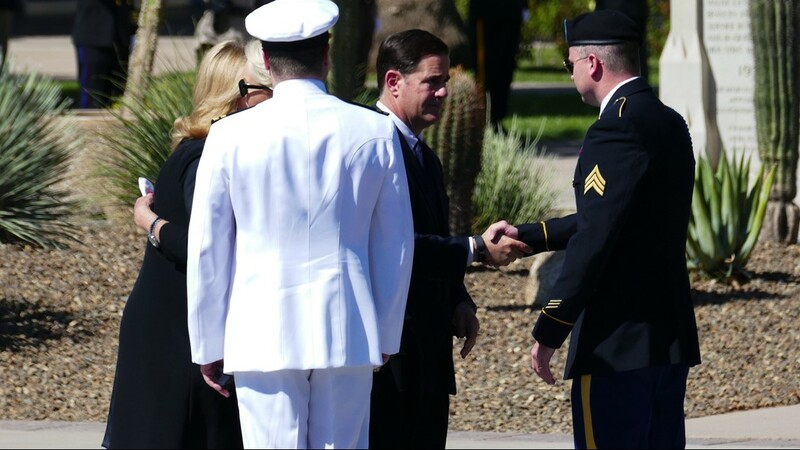 "We were the ones who were privileged, privileged to have John McCain fighting for us," Ducey said, "privileged to learn from him. Privileged that when he was back home to run into him at the movies or at a ball game or at Starbucks just like he was anyone of else. Privileged to proudly call him a fellow Arizonan. " Ducey said to the rest of the world, McCain "was Arizona." "When all of us here traveled and told people we were from Arizona, people knew two big things about it," Ducey said, "John McCain and the Grand Canyon." "Imagining Arizona without John McCain is like picturing Arizona without the Grand Canyon. It's just not natural." Ducey said McCain's fight for America wasn't over adding "it's a fight all Americans are obligated to continue on his behalf." 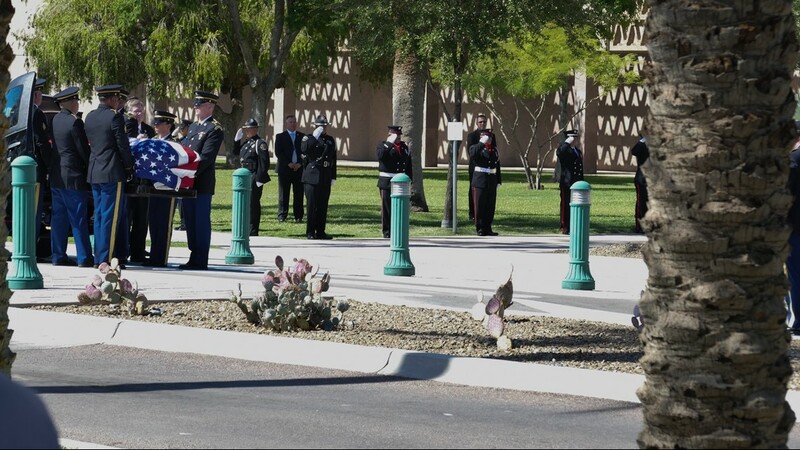 McCain's lifelong friend and former Congressman Jim Kolbe placed a wreath by his side before Sen. Jeff Flake delivered a touching benediction. 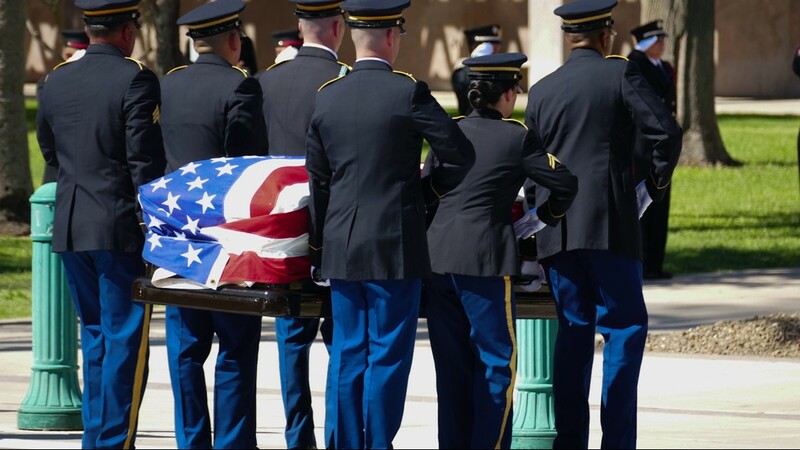 With his head bowed in prayer Flake said "we are especially grateful that John made Arizona his home." "All of us are grateful for John’s able representation over these many years," he said. "Let us go now from this place in peace and comforting one another in the sure knowledge that one day we will join John in his home in Heaven," Father Reese said. In McCain's final days reflecting on his time serving Arizona and the nation, the word "blessed" was used often. It's that same word that was spoken by many who honored the late senator in Phoenix on Wednesday. 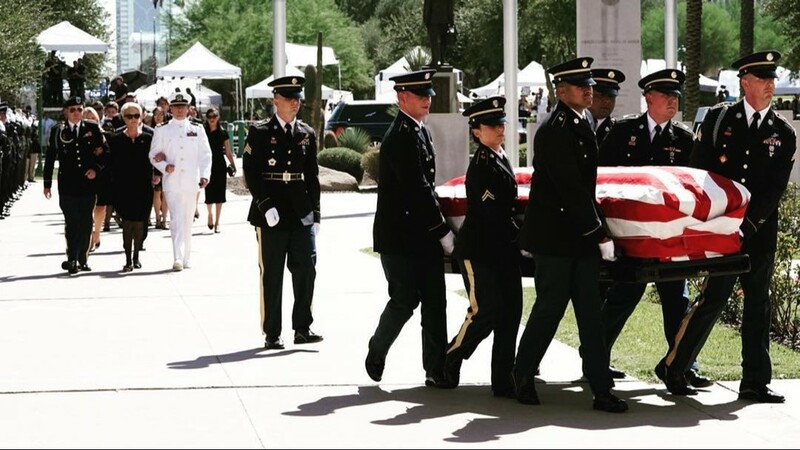 Thursday, Senator John McCain is spending his final morning inside the capitol, before his procession to North Phoenix Baptist Church for the continuation of his memorial services. 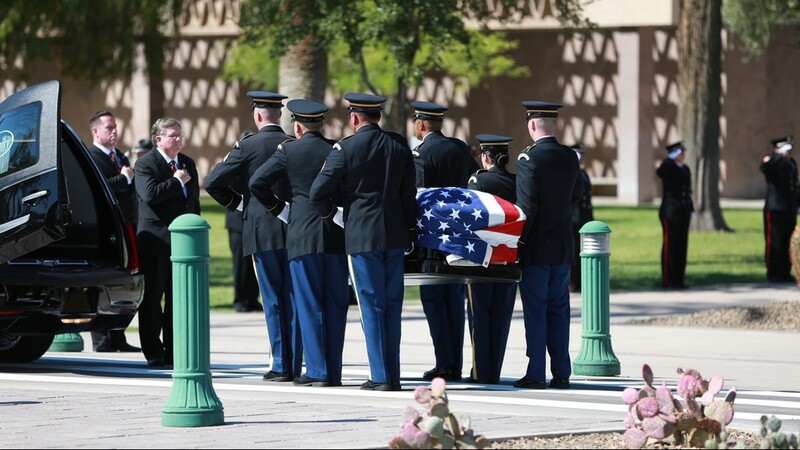 Another somber day is ahead for Arizona, as Former Vice President Joe Biden, 24 sitting U.S. 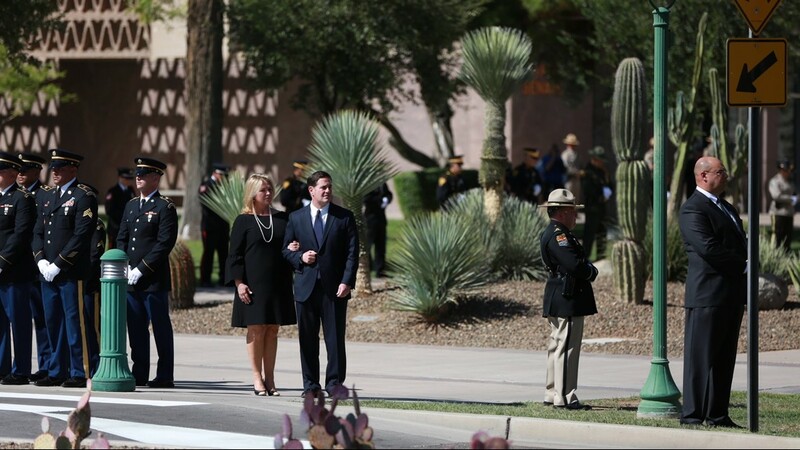 Senators, four former senators, and other leaders from Arizona will attend the memorial service. 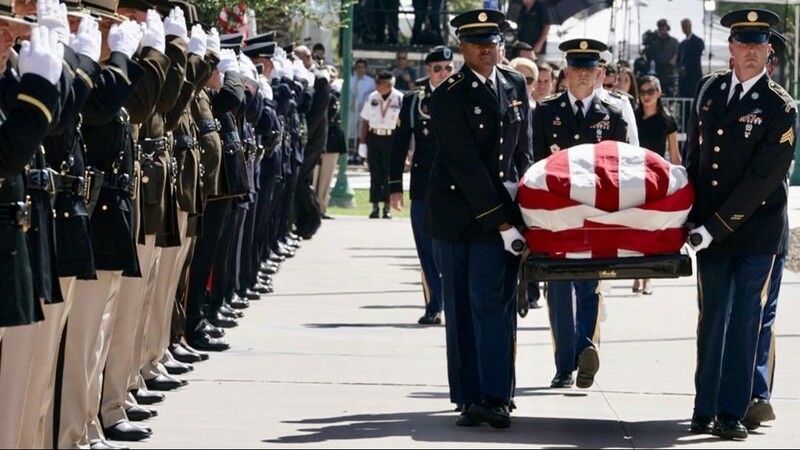 It will be held at North Phoenix Baptist Church honoring the life of Senator John McCain, a man who in his own words "lived and died a proud American."